The third-largest fast-food chain in the world may only be one year old, but it is already on a roll. Restaurant Brands International, the parent company of Burger King and Tim Hortons, reported results for its first full year on Tuesday. "I'm happy to report we finished the year up on a really strong note," CEO Daniel Schwartz said in the company's earnings call. "We've had one of the best years for both the brands in comparable sales growth and international expansion." In 2015, Tim Hortons same-store sales increased 5.6%, while Burger King's sales grew 5.4%. In January, a Morgan Stanley report called Restaurant Brands International an "underappreciated story" that most people had misunderstood. Here are four reasons why a successful 2015 is just the beginning for Restaurant Brands International. 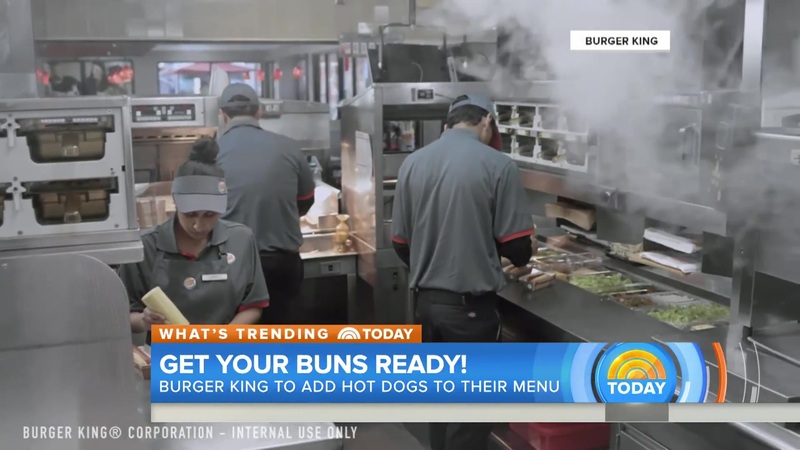 On February 23, Burger King is rolling out what the company has called the "Whopper of hot dogs." While the new dish has its flaws, analysts are predicting it will be a major area for growth. "On the surface this sounds like a bizarre move given that current menu change is usually geared around providing healthier options," Neil Saunders, CEO of retail consulting firm Conlumino said in a comment. "However, the simple truth is that while Americans like hot dogs, very few national fast food chains sell them. This step helps BK to stand out and in our view is likely to be successful." Last year, Tim Hortons more than doubled its number of locations outside of the US and Canada, with 55 new restaurants, bringing the company's total up to 113. Tim Hortons' growth is intended to imitate that of its sister brand, Burger King. Schwartz calls the chain's global expansion plan "similar to how we've scaled the Burger King brand in the last several years." Meanwhile, Burger King is planning on opening hundreds of new locations in countries including France, India, the Ivory Coast, and Morocco. Because both Burger King and Tim Hortons are approximately 100% franchised, quality of franchisees is of the utmost importance. That means trimming the fat when it comes to subpar franchise partners. In 2015, the company closed underperforming Tim Hortons locations in Maine and New York to focus on new development agreements in Cincinnati and Columbus. Internationally, Burger King closed locations in Mexico and ended a franchise relationship in Costa Rica, with a new partnership deal already signed. As demonstrated by the grilled hot dog launch, Restaurant Brands International is prepared to take risks when it comes to new menu items. Tim Horton's success in Canada and international markets was driven by Nutella pockets, while Burger King sales were driven by quirky limited time offerings like Buffalo Chicken Fries and the black-bunned A. 1. Halloween Whopper. The company focuses on "fewer and more impactful products" that customers can't get elsewhere, as opposed to sticking to a classic menu of burgers and fries. This strange menu innovation isn't going to slow down in 2016 — and neither will sales.